Phil and Jami Covone began their missionary journey by planting a Hispanic church in Georgia, and pastoring there for almost ten years. In 2015, God called them to live in central Mexico as full-time missionaries, working to see disciple-making movements begin all over the region. Phil grew up in Mexico as the son of Presbyterian missionaries, and now God is using his knowledge of the language and culture to build relationships and share Christ with the Mexican people. 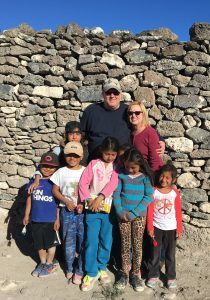 Currently, the Covones have several Bible study groups going in separate parts of the capital city of San Luis Potosi, and more in some rural villages and ranches outside the city. The mission of Covone Ministries is to make and multiply disciples, house churches, and to train new and existing believers to do the same, thereby reaching their own people for Christ. In order to accomplish this, Phil and Jami use a strategy that they call H.O.M.E. – “Help Others Mobilize & Evangelize”. In their home, and the homes of the Mexican people, they train existing Christians to begin Discovery Bible study groups who can become a church if so desired. Covone Ministries is expanding their reach with a new campaign: Project H.O.M.E. When our phase one goal of $25,000 is reached, the use of the house can begin! Project H.O.M.E. is your opportunity to help others mobilize & evangelize! Donate Below.